This is the Cardinal who has said that Vatican II triggered the “greatest crisis in church history” and who is in charge of the Vatican investigation (inquisitition I term it) of American women religious in over 400 congregations. This includes my own congregation, the Sisters, Servants of the Immaculate Heart of Mary. How can a Cardinal who has such a negative judgement about Vatican II stand in judgement over thousands of sisters who have renewed their life and ministry according to the vision of Vatican II? It’s gotten to the point where I’m beginning to feel sorry for the Congregation for the Religious. Asian women religious support their sisters in the States. 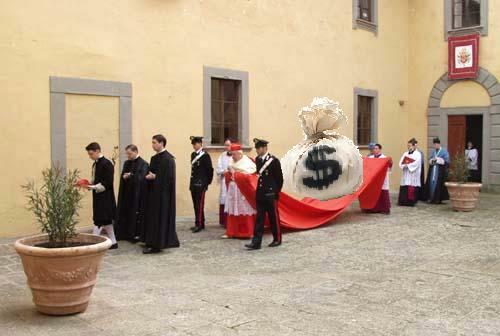 Tom Fox at NCR publishes photos that depict the cardinal as a lover of preconciliar extravagance. His paper polled some dioceses and more bishops than fewer seem disinclined to support this visitation financially. My suggestion for Cardinal Rodé is to appeal directly to the blogosphere. Really. He could set up a site, put that little PayPal button up on the sidebar, and bypass the prelates entirely. The SCGS* set will surely get the ball rolling for him. Feminism has three components. First, feminists believe that men and women are inherently of equal worth. Second, feminists seek to accommodate innate sexual difference (that is, biological differences between men and women) but to dismantle historically contingent, and thus inessential, differences of gender (defined as the meaning that society attaches to biological difference). Third, feminists recognize that oppression based on gender is intertwined with other forms of oppression, such as those based on race or class. The problem would seem a grave ignorance and a shocking lack of curiosity on … well, what’s going on in the world outside of silk and tassels and lace and such. I think the new Vatican “policy” is a good one. It presumes there’s a conversation of sorts going on with the world. I’m sure that Catholics and non-Catholics alike will respond in turn when the Vatican addresses important issues. A two-way conversation implies somebody’s doing some listening. And listening to the world can’t be a bad thing. Isn’t the money supposed to be pinned to the garment? Then again, maybe Connie Corleone could lend her money bag from her first wedding. How do we know from where the money for the cape came? Surely, it must have come from the poor box or at least out of some lay minster’s stipend.